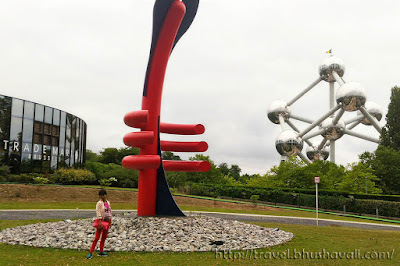 Last time when I visited Brussels, I had time only to visit the Atomium. That was the last thing for the day and I literally ran from Koekelburg Basilica to the metro station and from there to Atomium, to reach it just 15 mins before the last entry time! I made it! This time, I managed to visit ADAM and Mini Europe as well! Apart from these 3 sites, one more place to see here is Oceade! However, if you’ve been following my other blog, Fashion Panache, you may know that I’m pregnant right now. So water rides in an amusement park is a big no no for me! So over to my experience at Mini Europe and Atomium Design and Art Museum! The park begins with Denmark. No, not Copenhagen but with Trellborg! It depicts the Vikings camp of 1000 CE with its circular fortress and wooden long houses! But the best part is the enactment with miniature humans and ships and barrels!!! Then we proceed with Copenhagen’s Exchange and Nyhavn. Next we move to Sweden, Finland, Estonia, Latvia etc. The major next portion was dedicated to ofcourse, Belgium! It began with Curtius House in Leige, complete with a canal in front of it! Can you find the arguing car drivers in Leige’s road? Next was early Gothic Our Lady church in Dinant, complete with the stained glass details and arches in the architecture! There’s also a stunning parade in front of it with musical band, floaters etc! There’s also a cable car that takes to the Citadel!!! Then was the Brussels Grand Place depicting……….. you’re right if you guessed the 2016 Flower Carpet! Here’s the real flower carpet of 2016 and the miniature and yours truly posing in front of both! This was followed by several landmarks from Netherlands including Amsterdam, Veere, Kinderdijk etc. Next was Antwerp followed by Leuven and Ghent! A week after I went here to Mini Europe and photographed miniature Leuven, the next weekend I was at Leuven, photographing the real thing!!! Travelogue of Leuven coming up soon, stay tuned! Next was the UK, beginning with Big Ben, followed by a couple of sites in Ireland, and then began England with Longleat House, The Royal Cresent of Bath, ferry across English Channel and Dover Castle! The mere feeling of seeing the same sites again in a miniature size brought back beautiful memories of my visit to those very places! Next France began, obviously with Eiffel Tower in Paris, followed by Arc de Triomphe and Montemartre hill (yeah, that's the real vs miniature Eiffel)! There was also a miniature railway track showing Thalys, the high speed train (check it out in the video). This was followed by Portugal, Spain, Malta etc and moved over to Italy, ofcourse showing their prized possession, Leaning Tower of Pisa!!! This was followed by a working miniature of Mt.Vesuvius in eruption, which destroyed Pompeii! This was followed by all other European countries incl Germany, Luxembourg, Czech, Slovak, Hungary etc. finally wrapping with Greece showing the stunning Athens Acropolis!!! There’s also a large café, well maintained toilets here as well as some games for kids, testing their knowledge about the European countries! Btw, if you haven’t realized it yet, the links on the locations in this post, direct you to the posts of my visits to those ‘actual’ locations! Hoping to see the rest in reality too! From here our next stop was ADAM (Atomium, Design & Art Museum). Currently an exhibition is going on here on plastics. The first thing that it reminded me was of G.D.Naidu Museum collections!!! With phones of 1950s and computers of 1990s, it was one awesome visual treat! While I saw very early computers in G D Naidu museum, here were the old ones that were made with design aspect in mind! The permanent collection has about 2000 articles of post-modernism to pop-art era with so much plastic! Esp the furniture here were just stunning! 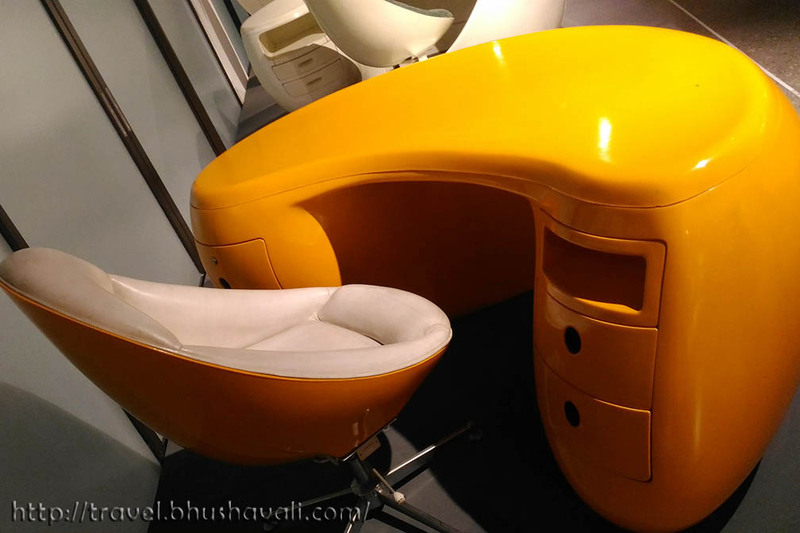 There was a chair made of clear colorless plastic that looked like it was a draped fabric! The early assembled, stacklable chairs were interesting too! 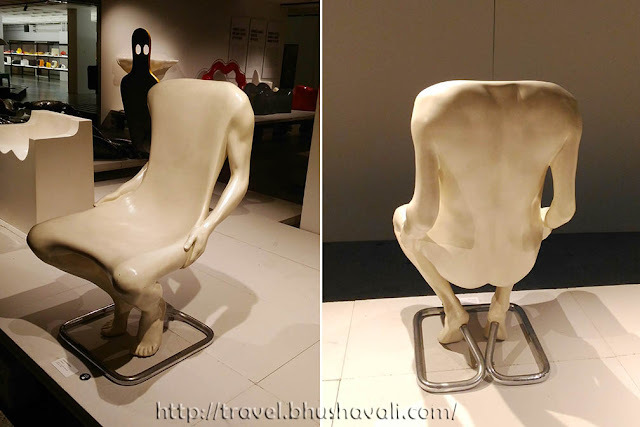 A particular chair that looks like a seated man was very intriguing! Office desks designed by Marice Calca were perfect examples of Art Nouveau sensibilities! With fluid designs made of plastic, totally fuctional! No wonder he has won several awards! P.S: Check out here to know what I wore! Refer to my earlier post on Atomium. Both these sites are walkable from Atomium. Entry fee: €15,30 for Mini Europe and €10 for ADAM. ADAM tickets can be bought online on their website! P.S: I was invited by ADAM & Mini Europe to experience them for review purposes, however the opinions are my own and this post does not to advertise the product/service. 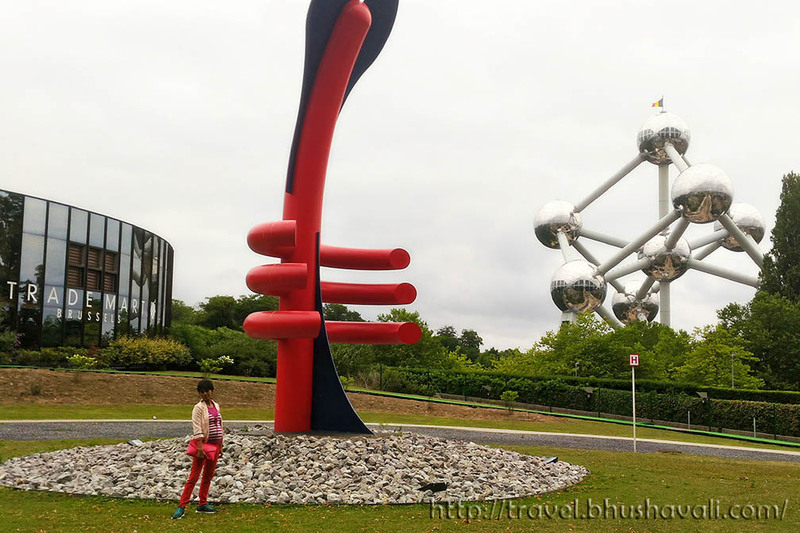 P.S: The photographs of Atomium in the background, were clicked by me but the structure/architecture/image of Atomium are copyrighted to Atomium till the year 2075 CE and these are being used in this blog and related social media with prior permission. Thank you for these detailed pictures! I have visited the mini-Europe park twice. The first time when I was a teenager and the second time with a group of Japanese students. They loved it! The park is a great spot to see All Europe in one day! You can get a free booklet at the entrance explaining the models and with relevant facts about the countries. Funnily enough when I visited Brussels this is the only thing I didn't get time to do! If you go again I recommend the museums and Delirium Cafe. I will try and go back to do Mini Europe, it looks so sweet! The only thing I visited when I went to Brussels was the Atomium as well. Great to know, that the city has so much more to offer. I never knew mini-Europe existed! So much detail put into the figurines and models - I'd say it takes a lot of work to maintain! Now my children would LOVE to visit all those places! I shall have to book a quick trip across to Belgium very soon! Wow Europe in 1 day and that too on foot, sounds unimaginable but this park has proved it. This Adam Museum showing Mini Europe must be wonderful and educational for children. I loved that Gothic Cathedral and Flower Carpet. I am also keen for ADAM as I love to see art and design museum. 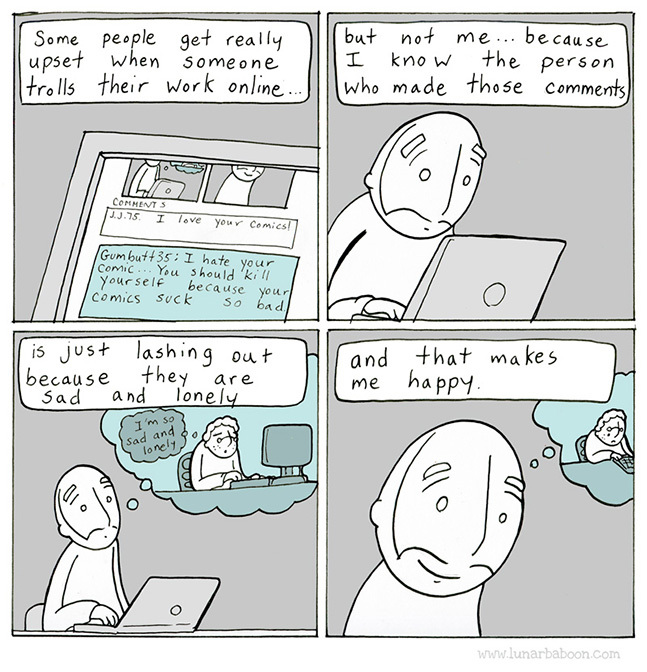 Beautiful post! I've never heard of this attraction in Brussels, but it does look fun! So much work must have gone into building this, I must remember the next time I'm back. I love those strange plastic chairs and sculptures too, very unique indeed! That is a really interesting museum. I've been to a similar one in The Netherlands and it was amazing. I would love to visit this one too. I was in Brussels a few years ago and had no idea this Mini Europe was even there. 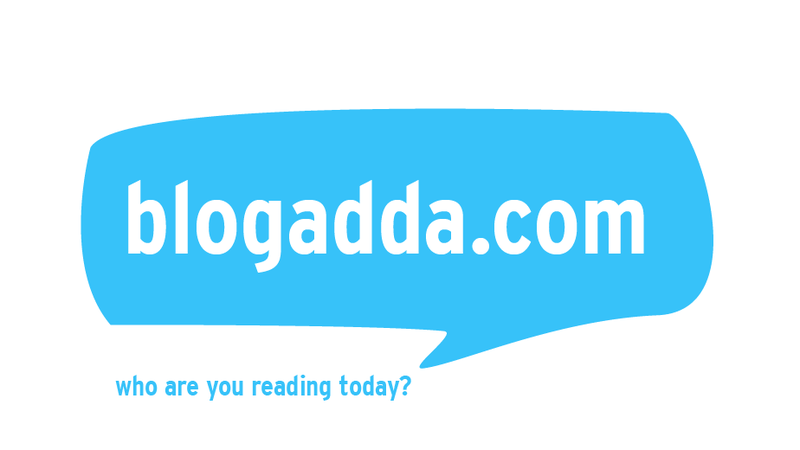 It's a really chilled city, and your posts shows the fun side of it. Thanks for the info! Wow, I am floored at the details in these pictures, I had never heard of Mini Europe and it would be quite spectacular to visit and see. I have a Mexican Uncle (my daughters mothers Uncle) who visited Brussels. He visited the Mini Europe and when I told him I was visiting Brussels he kept on about the Mini Europe! I think it's his favourite place in Brussels and all of Europe. I didn't visit however and he was a little disappointed, I'll send him your link as I'm sure he will love this article! It looks quite detailed with all the important monuments of Europe, especially the Eiffel Tower and your comparison with the original! The mini Europe looks awesome and ADAM is very interesting!! When we visited Brussels, we didn’t make it to Atomium’s last entry time nor see the Mini Europe and ADAM! :( We really need to go back to Brussels to see these attractions. Mini Europe (Brussels) shows the major sights and places in Brussels which have a great historical significance. We've similar mini Philippines. We call it Nayon Pilipino (Filipino Community) which showcases all the tourism spots in our country. This is really an amazing place to visit! Cool and very attractive. Very nice idea to put major sights into one place. Mini Europe sounds like so much fun. I love that they have so much detail like the drivers arguing! That would be fun to find. I wished this was something I visited when I was in Brussel. Instead I too went to the atom. I also read your post about the flower carpets and love that thy were featured in Mini Europe! That's a super creative and unique collection you featured from there! I love reading travel posts! It's good that you were able to take a photo by the Eiffel Tower with not many tourists around. And that Apple laptop that looks like a toy! I used to have one! Wow nice pictures. Mini Europe sounds like real fun. I remember Brussels as one of the prettiest places I have visited. I love miniature museums. I had no idea they had one in Brussels! Loved the car accident scene. That plastic human chair in ADAM looks so crazy! I've never been to a miniature museum before, so I loved reading this! So cool how they have little replicas of some of the big popular structures throughout Europe. Mini Europe is really fascinating.Seeing all the European landmarks in miniature version must indeed be a thrilling experience. Sights like the Eiffel Tower, Leaning Tower of Pisa, look so much like the original, as if by some magic they have been shrunk. This is such a lovely mini place.. I'd love to visit here one day.. Nice!